There is a need for NATO to consult with Russia, India and China (RIC) and countries in the Afghan neighbourhood to try and infuse an element of stability into the region, particularly with the creeping influx of the Islamic State. Hamid Karzai, former President of Afghanistan and an advocate of inclusion of Taliban in the policymaking process, said recently that it is necessary for NATO to consult with the RIC countries for peace and stability in Afghanistan. Karzai’s assertion brings home a crucial point: exclusive efforts have failed in Afghanistan, and it is necessary that an inclusive internal and external format for peace is evolved. At the internal level, this implies including moderate Taliban in the policymaking process and at the external level it implies cooperation between all stakeholders in the conflict, including Russia, India and China (RIC), the US, EU, Pakistan and Central Asian countries. Recent developments have added urgency to an inclusive peace process. The surge of the Islamic State (IS) followers in Afghanistan has undermined Taliban, which mostly confined its operations in Afghanistan and Pakistan. The death of Mullah Omar has left the Taliban, the once formidable power in Afghanistan, almost rudderless. The current Taliban leadership does not evoke as much authority as their predecessors. Between the Taliban and the IS, the former can be considered less dangerous because the IS has a global agenda. And, it has emerged as more dangerous as disgruntled youth from RIC countries and the neighbourhood have joined the radical organization, worked for them, and threatened peace at home. While it is vital to build Afghan forces to fight the Taliban and the IS, it is also necessary to have an international force to support the Afghans till the country has stabilized. The Taliban remains a formidable force. A wedge has been created between the moderate and radical Taliban (Karzai, while in office, called the moderate faction Talibjan), with the former possibly joining the ruling coalition, the likely alliance between radical Taliban and IS would prove more intimidating. Some of the Taliban leaders have sworn allegiance to IS, which has further contributed the unstable situation. Despite enjoying a closer relationship with the current Ashraf Ghani government, the US has been unable to stop the onslaught of the radical forces. A rise and dominance of radical forces in Afghanistan will have multiple negative consequences. It will threaten stability of Central Asia and other regions. It will threaten multi-ethnic and pluralistic societies of RIC and the neighbourhood. The IS has already spread to these regions. Major projects like the Silk Road, North-South corridor, and other developments aimed at integrating Eurasia will be threatened. The prospects of energy pipeline projects like TAPI and IPI will be further undermined. Similarly, the problems of drug and weapons trafficking are equally challenging. A recent report suggesting that the IS has acquired mustard gas and used it in Syria invokes the dangers of chemical weapons and possible application in Afghanistan and neighbourhood. Cooperation between NATO and RIC, and other regional organizations like SCO and CSTO, can be advantageous to all countries. The coordinated military might of the coalition will trounce the radical forces. The possible cooperation will also be lauded by the international community, as there is a perception that lack of cooperation between various stakeholders has contributed to the protracted nature of the crisis. 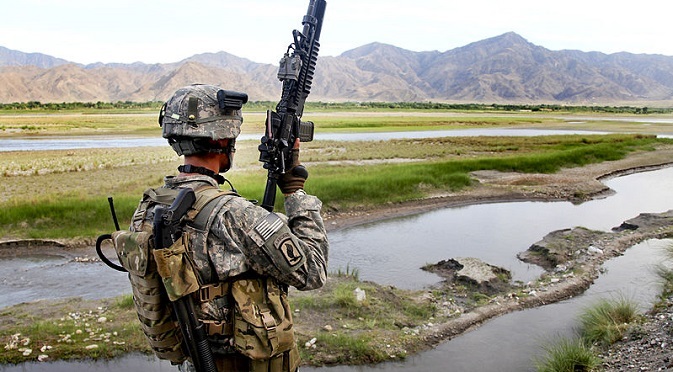 Russia and the US can use their experience in Afghanistan to the advantage of the coalition. Few months back, the meeting of RIC officials in New Delhi emphasized on coordination for peace and stability in Afghanistan. They argued that “the situation in Afghanistan is closely connected with the regional security and stability,” and emphasized that “they support peaceful reconciliation and economic reconstruction of Afghanistan.” Similarly, the joint statement of BRICS at Ufa in last July emphasized coordination and peaceful transition in Afghanistan. The deepening of the Ukrainian crisis has further contributed to the perception that there can be no meeting point between NATO and RIC. This article argues such a perception is statist and it does not take into account recent developments, which indicate that the stakeholders including Russia and the US, and their allies, may come together. Last month, Russia and the US despite their differences on Syria unanimously approved a resolution on Syria condemning the use of chemical weapons such as chlorine in the war. Recently, Russia rescued a Ukrainian citizen from the captivity of the Taliban.